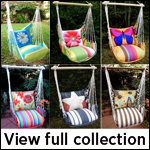 If you love decorating your outdoor paradise with beautiful and comfortable functional items, you will likely fall in love with our exciting hammock swing chairs. This new Citrus Stripe fabric will create quite an impression, and with a gorgeous decorative pillow of your choice as the accent, will reveal some of your personal style. You will love it!